How To Address Bad Housekeeping Without Shade? I need some relationship and life advice guys. So, as some of you might recall, I've been in a new city going to medical school. It's winter break until January, so hooray, I have moved back to Big City and moved back in with my partner of 5 years. I am super happy to be back and being able to see him every day is bliss. However, there is one thing that is really bugging me. His house is a mess. Things are mostly organized but there is a layer of grime over every surface. There are no clean linens, the lightbulbs are all out, no sheets on the bed — overall the place has been neglected. 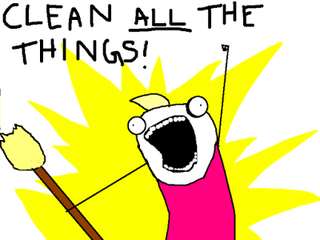 He's at work all day and so I am totally okay with doing some cleaning. I went grocery shopping and grabbed some cleaning supplies & I'm going to try and spiff things up over the next few days. But this is not my job. And it has never been my job — we shared the cleaning when I lived here. I let him know I wanted him to clean the place up when I saw it was like this on Thanksgiving break, and he clearly was not able to do that. I'm trying to figure out (a) why this place is so dirty and (b) how to let him know, gently, that I am not his mama and that he needs to take care of his place like a grown man. Part of me is a little worried he has been depressed. I mean, who wants to live like this? How do I talk to him about this respectfully? ETA: I had a very direct talk with him and managed to lay it out neatly without getting all "Blank Space" on him. He agreed to get the place cleaned professionally. GOL!